This Tachyon III model has a Apocalyptic finished ELMAX steel clip point blade and durable type III black anodized handles. Includes adjustment tool. Its light, but fun to flip for laughs, chaplins are hard to do, the ball bearings make it feel wierd to flip but fanning and flipping this thing is like a gimmick, but a fun one. 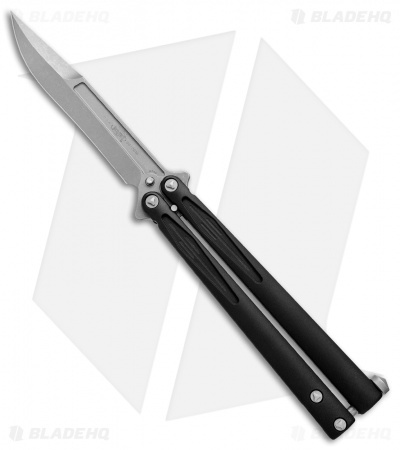 ****** This is my first high quality balisong. It feels and sounds AMAZING. I have owned cheap flippers my whole life, so it was a weird transition between thrashing a bottle opener to cautiously flipping something that could A) really cause grief if dropped tip-down and B) REALLY cause grief if dropped tip-down on my foot. 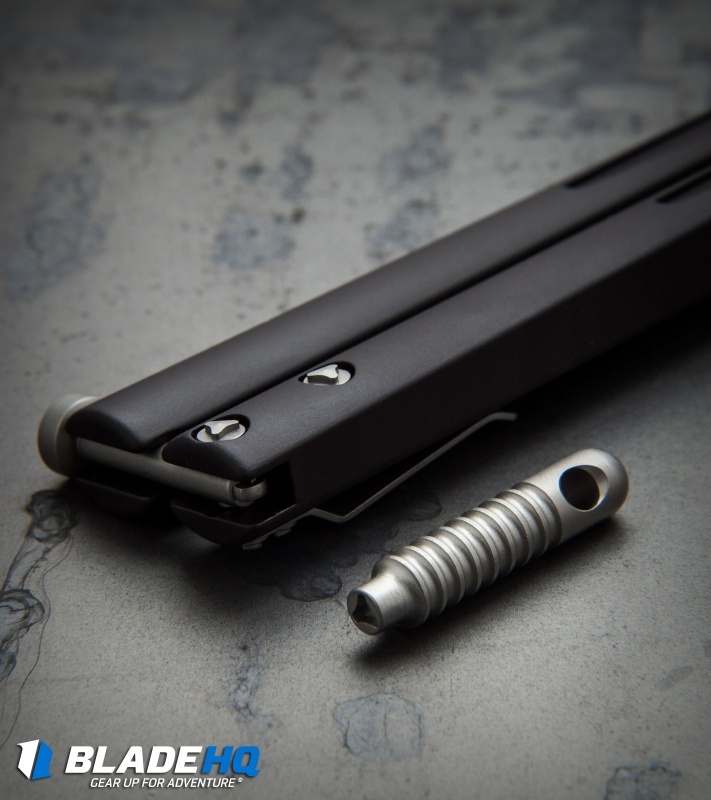 This knife easily has the most efficient blade-profile for piercing I've ever seen. I own my share of folding knives, but this is my first balisong. 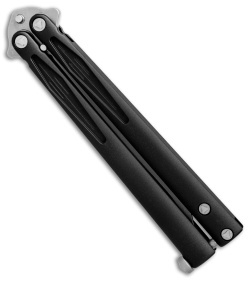 I've had a few cheap butterfly combs, bottle openers and the like throughout the years and figured out most of the basic moves with those. Otherwise, I don't really know anyone locally who even owns a balisong much less flips one with any kind of skill. When I got the itch to purchase a quality balisong I wanted it to be special and this knife did not disappoint. 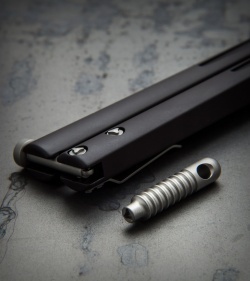 I own a few other Microtech OTF models, but with my only prior balisong experience being low grade wannabes I was shocked with how smooth and quiet this thing flips in addition to just being a work of art. It definitely exceeded all of my expectations and is well worth the price of admission. I don't know first hand how it flips compared to the Benchmade 51 or BRS Alpha Beast, but it has not left me wanting for anything else at the moment. Not a bad place to start at all. Sure, I'm a knife collector, so I'll probably end up with a BM51 and others at some point. But, for now, I'm looking forward to improving my flipping skills and I doubt I'll be outgrowing this one any time soon. If you're wondering how the aluminum feels, it's pretty much the same as any aluminum MT OTF. I'll definitely get the Apocalyptic Serrated version if it ever comes back. Thank you once again Microtech and BHQ! Love this knife a lot. Thought I was gonna be disappointed but I was proven wrong. It flips really nice and feels great in hand, should have bought two. I had reservations about purchasing this knife. 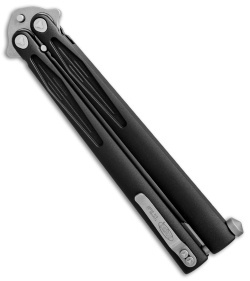 I own a Tach 3 with Titanium handles and I've been waiting for the production run to buy another. I was extremely disappointed once I found out that the production run would have aluminum handles (especially considering the price). IMO a knife made with aluminum handles should never be this expensive. Please be aware that the rating and review I'm giving doesn't have price factored in to it. Anyway, I reluctantly decided to purchase this knife with the thought that I would just return it and get a Ti handled version if I didn't like this one. To be honest, I was pleasantly surprised with this knife. This one flips extremely "fast" should you choose to do so. Balance is extremely good IMO (however flippers vary on what the balance of a knife should be for their flipping style). There is almost zero blade wiggle or handle play. I have many different bali's in a wide range of price points and they all have there own unique quality and this one is definitely a home run in a wide variety of characteristics that a bali should have (price not considered). This knife is a tad light however, heavier than a 51 and larger. This knife will be staying in my collection, the more I flip it, the more I like it. If you are on a budget and were planning on buying a 51, I would say wait and save up an extra $55 for this one. This flips, hands down, 10 times better than a 51. You won't be disappointed. I've only been flipping this knife for about 2 hours now so I can't speak of the durability. I really don't know how the aluminium handles and the black anodizing will hold up over time. I really don't care about the ano not holding up because I'm planning on changing the color scheme anyway. I mod every knife I own to "make them mine". I just hope that the aluminium handles hold up, time will tell.